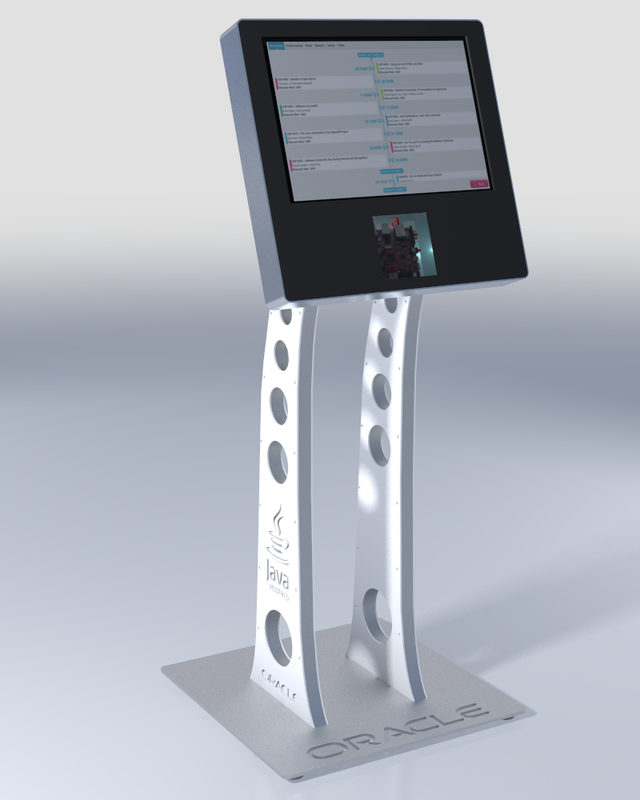 A month or so ago at work I heard that one of my colleagues was planning to build a kiosk for a trade show. We’re working on a new release of software that will run on embedded devices like a Beagle Board. I’d actually thought about making a handheld device using one of these along with a small touch screen to be a home automation controller (or something). Never mind that I live in the woods and don’t have electricity or internet access anytime it’s windy. But I digress. Anyway, we were just chatting about Jasper’s idea for a kiosk when I opened my mouth to say “that sounds really cool”, but instead the words “I’d like to help with that” came out. Wait, did I say that out loud? 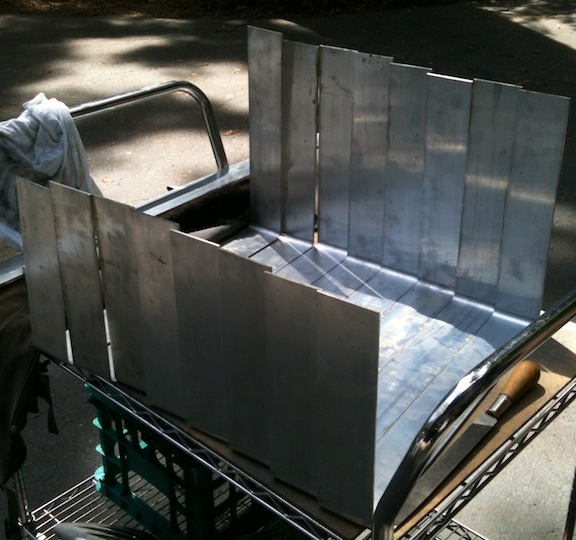 Anyway, Jasper built a prototype and I fabricated the Aluminum shell for the main body. 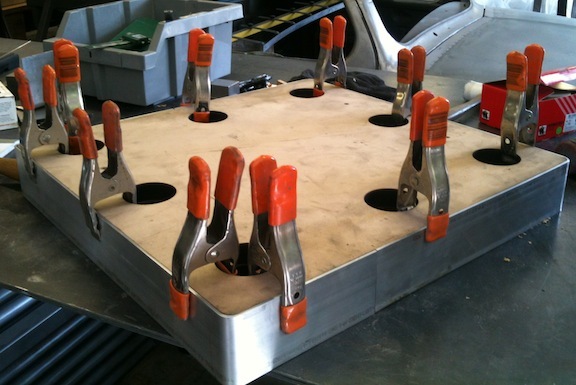 He did all of the heavy lifting – cutting legs out of plywood, painting, wiring and assembly. 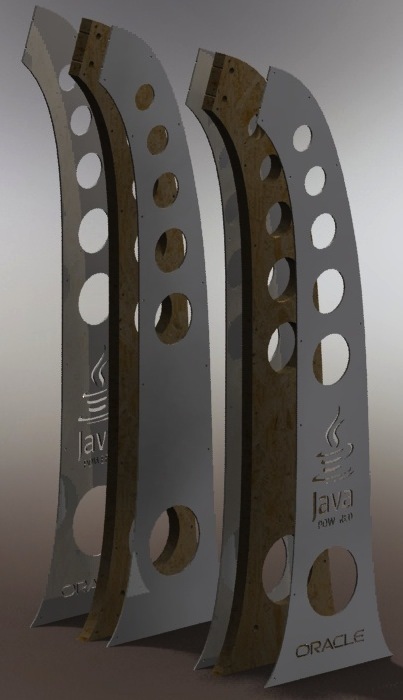 The goal was to get budget approval to hire someone to make a bunch for the JavaOne trade show in a couple of weeks. We got budget to buy materials for 4 instead. Guess what that means? This is the final design that Jasper and I worked out. The legs on the prototype were a similar shape, but wider and thicker, made from two layers of 3/4″ plywood. Jasper had a tough time getting a decent finish on them due to the rough grain and voids. 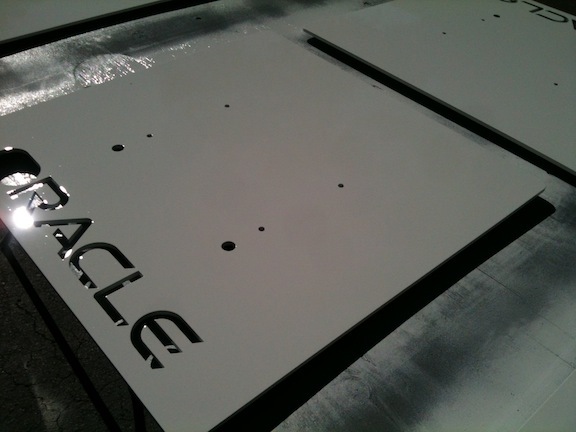 To simplify matters we opted for 1″ thick MDF for the legs with 1/8″ acrylic sheet for the two sides. The logos are cut through the plastic. This allows us to have a routed groove in the MDF for wires, and only have to worry about painting the edges of the legs. In theory. It turns out that the plastic was a translucent white, so the legs needed to be painted everywhere, although the surface finish on the faces of the legs wasn’t critical. We had all of the parts laser cut, which was the only way to get this done in any reasonable timeframe. My job was to make four aluminum bezels, and paint the bases and legs. Jasper is doing all of the assembly and wiring, as well as loads of separate tasks – like routing the wire grooves, fitting in the 100 or so threaded inserts and a bunch of other stuff I’m glad to avoid. 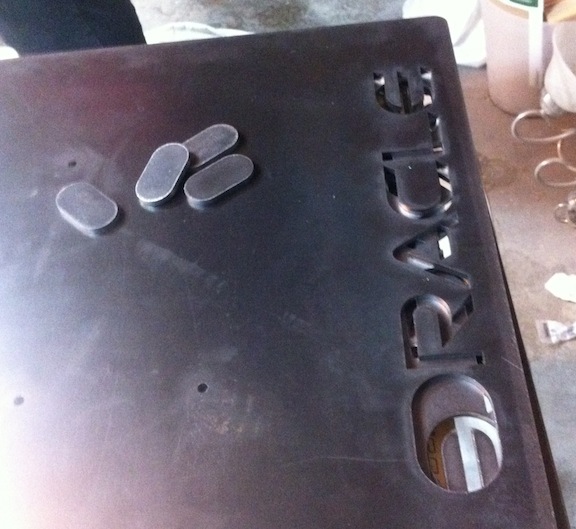 The bases were laser cut from 1/4″ thick steel. They are every bit as heavy as they look. I cut 1/2″ thick slices from some 1 1/2″ diamater steel rod and welded these discs to the bottom of the bases to make 4 legs. Originally we were going to use stick-on rubber feet, but it was obvious they weren’t up to the task. I used my sandblaster to remove (some) of the mill scale, but didn’t have a lot of success. I hadn’t used the thing in a few years, and the sand in it had gotten damp. I burned up a lot of time fussing with it, and finally (100 pounds of sand later) settled on just getting the area around the logo down to bare metal. Sometimes the scale on hot rolled steel just leaps off the surface, and sometimes it’s really tenacious. I decided if it was a struggle to get it off with high pressure sandblasting, it was probably a decent substrate for paint. I sanded the face with 8o grit, which did almost nothing, then scrubbed them with a solvant pre-cleaner (lacquer thinner followed by PPG Acryli-Clean). I shot them with two coats of 2K high build epoxy primer, sanded them smooth to 320 grit, sealed them (because I sanded through the primer in a few spots) and shot them with two coats of automotive paint. I used Nason (DuPont) single stage 2-part urethane. It flowed out really nice, and had a great gloss. The open time on it was a lot longer than I would have expected (it was tacky for about an hour), but even so there were only a few dust specks in the finish. The MDF legs required a lot more work to prep. The laser cut edges were burned, and while the cut was smooth the surface wasn’t anywhere near smooth enough to get a glossy finish. I shot the edges with 3 coats of the high build primer (that stuff is great), then hand sanded with 150, 220 and 320 to level and smooth everything. Hand sanding inside oll of those holes was not the most fun I’ve had, but I had the stereo cranked up with my “Rockabilly Revival” mix and just powered through it. Repeat the process of spraying a sealer (to help get even color coverage, adhesion and prevent against sand scratches), followed by two coats of the same urethane paint. Finally I had to make four Aluminum bodies. I figured out the bend allowance so I could get the dimensions just right and only have two parts (and two welds) per bezel. 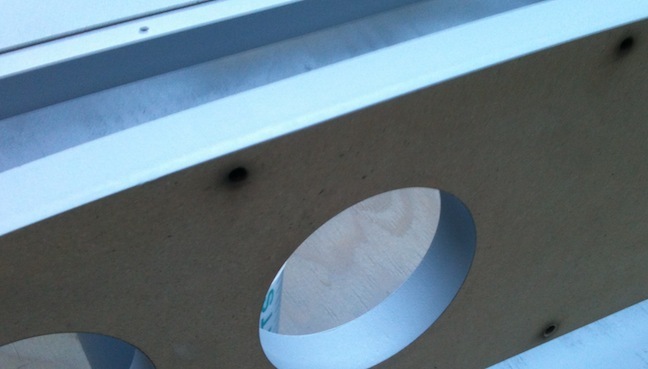 I had three blocks the size of the inside of the housing cut from 1″ MDF to serve as a fixture. This made getting the parts a consistant size dead easy. Here I have the first two halves trimmed, de-bured and clamped to the fixture. I tack welded them on the fixture, then slid them off (not easily, it was a snug fit) and welded them solid. 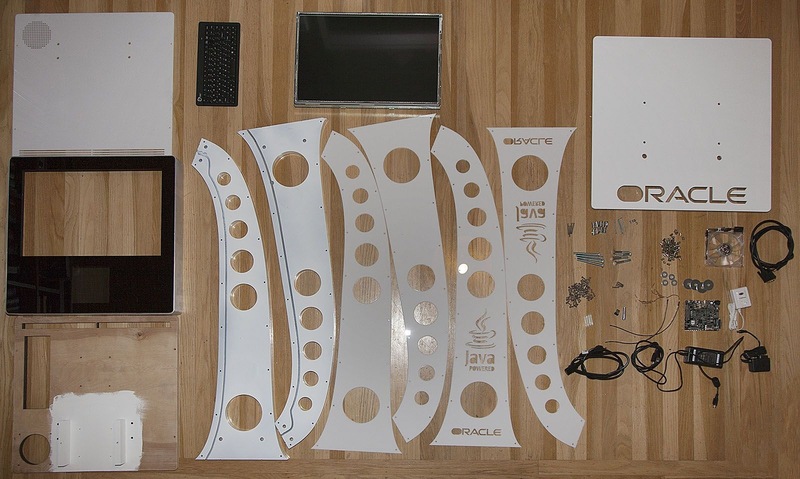 Here are all of the parts laid out for assembly. I have to epoxy the mounts to the inside of the last two rings, and final-fit the front and backs to the last two cases and then I’m DONE. Woot! I’m going to go do that now, maybe I can get in a little “me” time for some woodworking today still.